Pu Mat National Park, located in the central province of Nghe An and classified as a World Biosphere Reserve (the largest in Southeast Asia ) by UNESCO in April, has long been known for its bio-diversity. Covering 1.3 million ha, the park includes the Pu Huong and Pu Hoat reserve zones, creating a 500km green corridor along side the Vietnam – Lao border. Le Thanh Do, responsible for tourism promotion of the park, told the English-language daily Vietnam News that the park receives around 9,000 visitors per year on average. In co-operation with local tourism agencies, the park has developed a tourist map linking Cua Lo Beach, Kim Lien village (hometown of President Ho Chi Minh) and Pu Mat National Park. Do said that, apart from the 30 rooms for rent inside the park itself and hundreds of privately-owned hotels in nearby Con Cuong town, additional accommodation and entertainment services were essential in managing greater tourist numbers. Established in 2001, Pu Mat park hosts 896 different species of plants, 220 valuable herbs, hundreds of vegetables and fruits, 241 types of mammals, 137 types of birds and 25 types of reptiles. The forest is also the habitat of the largest herd of elephants in Vietnam as well as endangered animals such as the ‘Sao La” (a rare species of twin-horned wild cattle), tiger, panther and leopard. Located 25km from Con Cuong town, the 500m high Khe Kem Waterfall has always been popular among tourists, resembling a white silk scarf against the green canopy of the forest. Lying 40km from the park main office along the Tuong Duong – Ky Son route, the peaceful valley is covered by thousands of 20-40m high “Sang Le” trees, which belong to the family of “Bang Lang” (Lagerstroemia speciosa). The Sang Le forest hosts both recognisable and unknown trees, luring both domestic and foreign scientists, according to Do. The forest, currently covering 70ha, will expand to 300ha under new park management plans, help protect local residents against flooding, prevent soil erosion and save water for community consumption. Nguyen Thanh Nhan, director of Pu Mat National Park, said that local Thai ethnic minority from nearby Quang Thinh village, which tourists are allowed to visit along with close lying caves, have done much to protect the Sang Le forest. According to Nhan, the park presents a perfect backdrop for preserving the traditional weaving art, dance and gong playing of the Thai; the art of playing lip instruments and bamboo flutes by the Mong; water rice agriculture of the Tay Poong; sitting-sleeping customs of the Dan Lai and traditional dancing and singing of the Kho Mu. 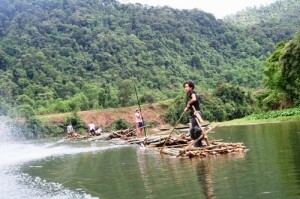 As many as seven ethnic groups with a combined population of more than 800,000 are currently living in the park, Nhan added. Ho Duc Phoc, chairman of the Nghe An provincial People’s Committee, admitted that local authorities faced a problem in creating a balance between preserving biodiversity and natural resources, promoting social economic development and maintaining the traditional cultural values of local ethnic groups.